A new skill slot is opened in the class selection dialogue, once you gain enough rank points. The player is promoted once for every 10 points achieved. There is a maximum of 4 skill slots available. Health Upgrade: Increases your maximum amount of health to 130%. The ability to take more damage makes this a good upgrade to use if you don't know what other skills to get. Health Regeneration: Slowly regenerates health, 2hp/2secs. This can be either useful or next to useless, depending on how long the fight lasts. This skill doesn't conflict with squad health regeneration. Ammo Increase: Doubles total ammunition and the rate at which you may gather it. Does not affect clip sizes, and stickybombs aren't collected faster. Stamina Increase: Doubles the rate that your stamina recharges, a good skill for dashing from one piece of cover to the next. For scouts, your stamina will recharge four times as fast as normal. Speed Upgrade: Increases the normal moving, running and sprinting speeds to 115% their normal value, and is generally useful when you don't have access to vehicles but have to reach the front line very quickly. This is better than Stamina Increase if you have a long distance to cover. Despite being only a 15% increase it makes a very big difference, especially for dodging tanks as a grenadier. Accuracy Upgrade: Increases accuracy on all weapons, different weapons are affected in varying degrees, but in general it will make your weapon about 50% more effective. Melee Upgrade: Increases melee damage from SMGs and pistols, enabling a melee hit to instantly kill a player. In addition to general skills, each class has a set of its own unique abilities. 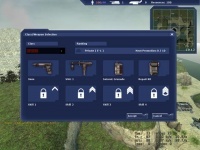 These skills can be accessed on the Skill Selection screen by expanding the dropdown in the upper-left side and choosing the Class Specific option. Healing Upgrade: Triples the rate at which you heal team mates. Significantly, useful, but healing doesn't work on moving players due to lag compensation. Revive is generally a better skill. Repair Upgrade: Doubles the rate at which you repair friendly structures and vehicles and disassemble the enemy's. This skill will also reduce the drain rate of using the repair tool by roughly 1/3. Considered the most powerful of the Engineer's skills. Is very useful at the beggining, when there are many buildings to build. Revive: Allows the Engineer to bring a fallen team mate back to life (the player will not have to use a ticket when spawning during this process) Select your engineer tool and use it on the fallen teammate. Has a very limited range. Dead players will have an icon over them allowing them to be found easier. Takes 50 charge units to use. Vehicle Cooling Increases the rate of driven vehicles heat dissipation by 15%, which may give an edge in toe to toe vehicle combat, but it shouldn't be taken before repair upgrade simply because fixing a tank mid-fight is much more useful than a bit less heat. Defusal: Allows the Grenadier to remove enemy mines from the field, clearing the way for others to safely pass. Grenadiers can also step on mines and drive on them without harm when they have this skill activated. This skill will not protect the grenadier from damage if someone detonates the mine. To remove a mine, crouch above it, and hold E while looking at the mine. There is no GUI for this skill, but it does work. Artillery Feedback: Shows an indicator on the minimap, in the form of a white diamond, which marks the location of any explosions caused by the grenadier, from mortars to RPGs to artillery to APC grenades. Armor Detection: Allows the Grenadier to know the health of enemy vehicles. When the crosshair is pointed at an enemy vehicle, it will be displayed at the bottom of the player's screen in the same manner as if the player were inside it. This includes the status of armor plating on all sides of the targeted vehicle. Increased Armor: Adds 20% armor to the vehicle the grenadier is driving. 10% is a very small number when referring to armor plates, and even on a heavy tank it only adds an extra half plate to each side. This skill is not very useful. Hide: Become transparent by staying crouched or prone for at least five seconds (each promotion lets you become transparent 1 second faster). The Scout becomes less visible with more of his body touching a wall or walls. It will conceal the user from Machine Gun turrets and prevent the enemy commander from targeting the Scout, but it doesn't conceal from an enemy Scout with the "Enhanced Senses" skill. However, it automatically deactivates when firing guns, standing, or taking damage, but does not deactivate when using melee attacks. Hide does not make a player invisible unless they are touching 3 surfaces other than the floor. Before that stage, scouts are still fairly visible unless in some form of geometry such as a building or some crates. Enhanced Senses: You have access to both allied and enemy information on your minimap. Works like a portable camera, but this ability has a small radius, the information is not conveyed to team-mates, and the targets aren't highlighted on your main screen. However, there is no delay between the enemy location and the information presented on your screen, so unlike camera's targeting squares, you know exactly where the enemy is. Furthermore, this enhanced mini-map displays everything that the enemy can normally see- you know exactly what direction the enemy is facing and you can see hidden scouts. Weapon Silencer: Reduces weapon noise by 50%, and hides kill and death messages. A unit killed by the Scout will not appear on the game's kill counter, even as a suicide- the only way to confirm his death is by checking the death or kill tallies on the scoreboard. Vehicle Speed: Increase speed of any vehicle the player drives by 20%. Can be useful when using jeeps or transporting allies using APC. Radar Stealth: Hides the vehicle the player is driving from any form of automatic detection. Player will still show up on cameras when not in a vehicle. Dig In: Deals 25% of all damage taken to the stamina meter whilst crouching or prone. Improved Rifle Damage: Increases Rifle and Pistol damage by 10%. Does not increase MG damage, and barely makes a difference in a firefight, adding an extra point of damage for each 10 damage done. Considering most bullets do 20~ damage per shot, an extra 2 damage really makes very little difference. Improved Vehicle Damage: Increase vehicle weapon damage by 25%, again not very useful in a fight, but it can make the difference. And on certain weapons (HE Cannon etc.) it can enable one hit kills against infantry. The most painful flaw of this skill is the fact that to utilize it, the player must be a rifleman inside a tank. Classes also have passive skill upgrades. As a player gains rank, they naturally become slightly better at their profession. Wall Mastery: Engineers increase their max wall limit above 10 as their rank increase. They get 2 additional wall per rank. Turret Mastery: After reaching Staff Sargent, Engineers are able to place 2 turrets instead of just 1. Surveillance Mastery: After reaching Staff Sargent, Engineers are able to place 2 Cameras/Radars instead of just 1. Camouflage Expertise: For every rank a scout earns, the time it takes for them to hide drops. Vehicle Resistance: This skill doesn't increase each level, and gives the grenadier 20% damage resistance to vehicle MGs and Cannons, giving them advantage against tanks over other infantry. Armor: This skill doesn't increase each level and gives the rifleman 15% damage resistance against infantry bullets. This page was last modified on 9 August 2016, at 07:20.